Have you given up hope? I sense there are many who are ready to throw in the towel and give up all hope of restoration of what has been stolen. What has been stolen from you? For many it has been your inheritance. Your reputation. Your finances. Your children. Your marriage. Your relationships. Your job. If you look at it in the natural, it seems hopeless. But hopelessness leaves us helpless and that is not what God says about your situation. Instead He says we are to become prisoners of hope. If you could measure your level hope on a scale of 1 to 10 (10 being highest and 1 being almost non-existent) how would you rate your level of hope? Are you on the verge of letting go of hope? What happens then is we become like a ship where the anchor has been cut away. The ship is then subject to every wave, every gust of wind as it is blown across the water. This leaves us feeling helpless when we are hopeless. Remember that hope is the ANCHOR to our faith. (Hebrews 6:19) And without faith we cannot please God. But without hope, we cannot maintain faith. They must coexist. The enemy of your soul wants nothing more than to steal your last vestiges of hope. The last ray of light. If you are about to let go, or have let go, this is a word to you. DON’T. Hope is the place of your restoration. What is a prisoner of hope? Return to your fortress, you prisoners of hope; even now I announce that I will restore twice as much to you (Zechariah 9:12 NIV). Hope is a fortress. By definition, a fortress is a place of protection and safety. That is where we are to return. We are to be prisoners of hope. A prisoner is one bound to something and held captive. Hope should hold our hearts and minds captive. Why? Because as we are anchored to hope, it in turn anchors our faith. And our faith pleases the Father and elicits a response. SEE ALSO: How To Get Your Inheritance back. With that in mind look back at Zechariah 9:12.
to retreat; to lodge, make, rejoice, bring back, to call to mind, to carry back to, fetch home again, pull in again, recall, recompense, recover, refresh, relieve, render again, requite, rescue, restore, retrieve, return, reverse, reward. As we retreat, return and lodge in the fortress (place of safety and protection) of hope and allow ourselves to be held captive to hope, it anchors our faith which elicits the pleasure of the Father and releases the blessing of restoration—and we are told with that release it brings TWICE as much of what was taken. How can we know that? Wait for it because it gets even better. The word restore found at the end of the verse is the same word as in Psalm 23:2 “He will restore my soul.” It is also the EXACT SAME WORD in the Hebrew as the word return at the beginning of the verse. Why is that important? Within the verse itself, there is the proclamation of DOUBLE. As it begins with the word to return—which means to recompense, reverse, reward, rescue and relieve us, as if that wasn’t enough, the verse ends proclaiming the same thing—except with the promise that He will do it DOUBLE and why it is said twice in the verse. He proclaims it twice because it will be done—double! This is what you need to take hold of, it means: Double restoration. Double rescue. Double refreshing. Double recompense. Double reward—of all that has been stolen, lost, removed, withheld, delayed. I want to encourage your heart again. If you are at the place that you are ready to or have let go of all hope. DON’T! With one prayer claim it back again. Allow Him to strengthen your heart and make your feet “like the feet of a deer” to make you walk upon your high places and take hold. Do you feel you need to retreat? Good. Retreat/return to the stronghold (place of safety and protection) of hope. It’s a place of rest. It’s where He will restore your soul and lead you beside quiet waters. Faith believes what it cannot see. But hope takes hold of faith by the ankles to anchor it’s feet to the rock. Hope breathes life into faith, like helium into a balloon, until what cannot be seen comes into view and becomes reality. 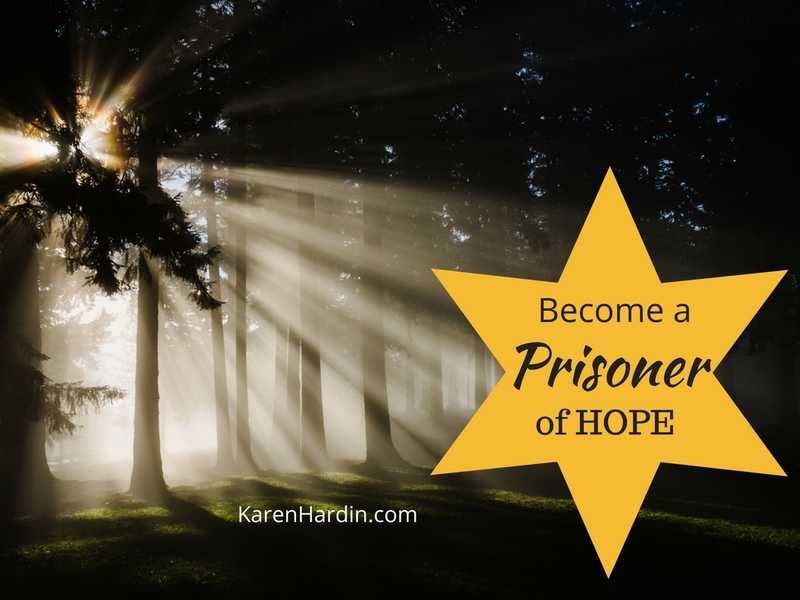 Become a prisoner of hope today. Father, forgive me for letting go of hope. I take it back again. I choose to believe and trust you that as I rest in the fortress of hope that you are restoring, rescuing, relieving, reversing, recompensing and resurrecting all that has been taken in my life. I receive double today, by faith, and won’ let go of your promise. Until I see it with my physical eyes, I take hold of it with eyes of the spirit to rest beside still waters as You restore my heart and soul. My labor is finished. I rest in You today that you will do it.